Oklahoma City sonic boom tests terrified residents in 1964. 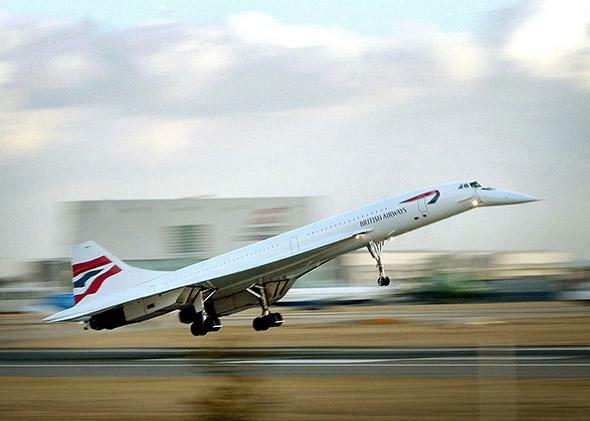 The last British Airways passenger Concorde flight lands at London’s Heathrow Airport from New York on Oct. 24, 2003. A number of efforts to bring back supersonic commercial flight with planes that produce quieter booms have been launched since its retirement. There were strange and menacing forces at work in Oklahoma City during 1964. The supposed culprits behind these weird Oklahoma City happenings 50 years ago weren’t ray guns or the Blob but what was considered at the time the future of aviation—supersonic flight or, more specifically, the 1,200 sonic booms the Federal Aviation Administration, then called the Federal Aviation Agency, subjected the city to from Feb. 3 to July 29, 1964. The FAA’s activities were part of the first major experiment designed to measure civilian responses to the sonic booms that most aviation experts and government officials expected to become routine with the dawn of commercial supersonic flight. Although the Concorde would later make that dream a limited reality for a time, supersonic flight never really took off and subsonic flight remains standard today. That’s partly due to the inherent limitations of supersonic aircraft and partly because the concerned citizens of Oklahoma City helped spark a movement against a technology advancing faster, and more loudly, than they were willing to tolerate. A half-century later, echoes of their anxieties can be found in the skepticism and fear that have surrounded new technologies like genetically modified foods and cellphone towers. Just a year before the tests began, the American airline Pan Am had placed an order for six of the Concordes then being developed by British and French engineers. That kind of transaction might not raise eyebrows today. But in the insecure Cold War days of the early 1960s—post-Sputnik and soon after Yuri Gagarin became the first man in space—it was a call to battle for supremacy in the skies. Days later, President Kennedy made a speech at the U.S. Air Force Academy announcing that the government would be sponsoring the development of an American commercial supersonic transport plane, a program that would continue with full federal support so long as three conditions were met: Producing the planes had to be technologically feasible, both production and operation had to be cost-efficient, and engineers had to keep sonic booms from annoying the hell out of people. Some officials and aviation experts thought the last condition would be the easiest to meet. Sonic booms, which, as NASA explains, occur when the breaking of the sound barrier creates a shock wave and loudly depressurizes air molecules, were already being produced by fast military jets. But for the development of a commercial supersonic transport plane to move forward, the FAA had to determine just how much booming ordinary Americans were willing to take. If any populace could have been expected to take booms in stride, it would have been the citizens of Oklahoma City, a town with a major Air Force base nearby and where, in 1964, one in every four jobs was in aircraft manufacturing. In fact, when the FAA settled on Oklahoma City as the site of its first tolerance tests—without asking the city’s elected officials and residents—the local Chamber of Commerce threw a celebratory dinner. That goodwill started eroding quickly. Within the first week of the FAA’s flyovers, which produced eight sonic booms every day, 655 complaints were registered. John Lear, the science editor of the defunct Saturday Review, wrote that the FAA’s spokesman sympathized. “[N]ervous people might have to rely on tranquilizers,” the spokesman told reporters. As the tests wore on, more and more of the town’s disgruntled residents started voicing their opposition and confusion. One woman demanded that the FAA stop dropping atomic bombs. Others called in furiously, the Washington Post reported, to complain about “broken chinaware, fallen mirrors and events—by their own timing—[that] occurred long after the booms had ceased for the day.” A resident claimed the booms ruined television reception. Another claimed the booms improved it. Both were wrong. By May, thousands of payment demands for broken windows and other small but real damages had been filed, and multiple efforts to stop the tests through the courts had failed. All Oklahoma City residents could do, as Lear wrote in a remarkable paragraph that June, was wait for the FAA to process their myriad claims. Even if it were assumed that all the claims were valid—that the seeing eye dog of a sightless vendor at the capitol was too frightened to perform its customary guiding function, that human victims of heart disease and muscular spasm were detrimentally stimulated, that older people had suffered falls and other accidents, that a schoolroom ceiling lamp had dropped and knocked a boy out of class for an hour … that wild birds had been driven from feeding stations in backyard gardens, that flocks of chickens had been crazed into erratic flight with considerable loss of egg yield and some loss of life—[Judge Stephen Chandler of the U.S. District Court] said the only redress was to wait for processing of damage claims, only 132 of which have been paid to date: a total reimbursement of $7,239 compared to a single claim of $15,000 entered by a chicken grower. By test’s end, that single claim had been dwarfed by a $1 billion lawsuit against President Lyndon Johnson put forth by a local man and his daughter seeking redress, according to the Los Angeles Times, for “mental, physical, and nervous damage.” The case did not move forward. The FAA ultimately only paid $8,608 in damages to residents and argued that the tests had actually proved most could get used to sonic booms occurring on a regular basis. According to data collected by the National Opinion Research Center in 1964, 73 percent of respondents to a survey at the end of the tests said that they could learn to live with eight booms a day. About 40 percent of those who complained felt that they could eventually get used to them. Nevertheless, the bad publicity surrounding the tests helped move public opinion against supersonic flight, and subsequent years saw concerned scientists, economists, and environmentalists mount a campaign to end the program to develop an American supersonic transport plane. Their concerns about the effects of sonic booms, aircraft pollution in the ozone layer, and the emerging cost efficiency problems hobbling the government’s chosen model, the Boeing 2707, ultimately led to the program’s abandonment and, in 1973, the banning of civil supersonic flights over land. Since the Concorde was retired due to financial pressures in 2003, a number of efforts to bring back supersonic flight with planes that produce quieter booms have been launched. If the booms produced by planes like the Spike S-512 are less disruptive than the ones that are produced by the Concorde and that would have been produced by the Boeing 2707, we could resurrect the possibility of three- or four-hour coast-to-coast and trans-Atlantic flights within a decade or so. To that end NASA just this year presented research on a potential civil standard for the intensity of sonic booms—a universal goal that engineers and aircraft designers can work toward. When prototypes finally fly out for testing, the FAA had better give fair warning to the towns below.